SJ Currency Rates - a Free Joomla! Module is a simple module for displaying daily exchange rate. It comes with 10 currencies and default base currency to your choice. 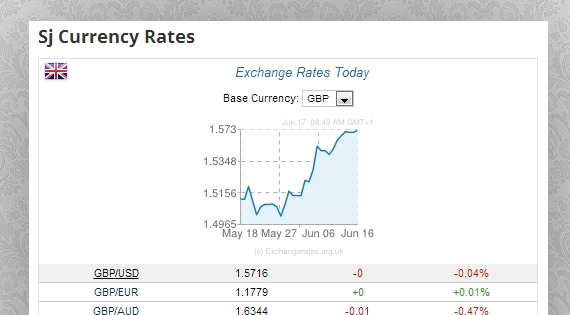 Beside, SJ Currency Rates includes Chart that is very useful to see quickly the increasing and decreasing of exchange rates. This module also allows you to set up timezone in exchange rate chart. Made for Joomla! 2.5.x and 3x, this is a Free Joomla! Module that business must have.